BOTTOM LINE: The funniest show about bipolar disorder and panic attacks you will ever see. I like Maria Wojciechowski (I’m going to make sure I get this name right, my own surname having suffered years of spelling abuse), and I’m sure Maria Wojciechowski would like me. We love our pets, have experienced musical theater in our past and share the same affection for quirky musical instruments and dark puns. I’m sure if we ever met, we’d get along swimmingly. We’d get hopped up on bubble tea, talk about how awesome Broad City is and compare notes on our respective therapists. My new best friend was diagnosed with bipolar disorder last year and suffers from panic attacks. 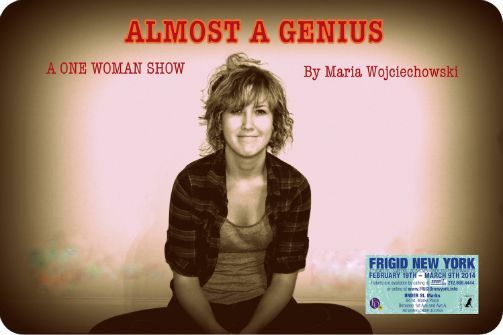 I have also had a history of mental health issues, so I really relate to Wojciechowski’s take on the subject in her one-woman show Almost A Genius. Some of the best comedic material comes from the darkest parts of the human experience (see: Louis CK, Patton Oswalt, almost all comedians who don’t rely on props…) and Wojciechowski balances the more painful aspects of her struggles with disarming humor. The first time we see Wojciechowski in Almost A Genius she is dressed in a banana costume and looking miserable. She approaches a microphone (after a long, awkward walk from the wings, her shoes exhaling long, wince-inducing creaks) and proceeds to tearfully recite a series of banana-based puns. It is hilarious. I cannot begin to describe the absolute joy of watching someone sputter out one-liners such as “My boyfriend just left me for an organic banana. I guess he found her more a-peeling,” while choking on tears AND wearing a banana costume. The poor girl looks like a child forced into a school talent show after a big fight with her mom, and I loved every moment of it. Wojciechowski spends much of Almost A Genius talking about her diagnosis (which came with the thrilling revelation that she’s a few I.Q. 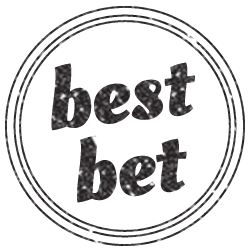 points away from being a legitimate genius) and the weird quirks that come along with it. When she is delving into this material, Wojciechowski is at her most appealing (no pun intended). Her willingness to be vulnerable makes her an engaging stage presence. Whether she’s sassily recounting a Wikipedia battle between her and her dad or remembering the death of her dog (which brought on genuine tears) Wojciechowski provides such moments of raw emotion that it is impossible not to root for her. At her best moments, she reminds me of Maria Bamford, another comedian who has used comedy to explore mental health issues. Where Almost A Genius does falter is during some of the non-sequitur character sketches Wojciechowski likes to employ. Some of these skits (the banana bit, a performance of “How Do You Solve A Problem Like Maria?” that functions as a reflection of Wojciechowski’s insecurities) work because they build on the themes of the show and are relevant to what we know about Wojciechowski. Other moments -- like when Wojciechowski plays a horny art teacher, or a 19th Century London prostitute, or Air Bud’s frustrated younger brother -- deflate the show a little. It’s not that they aren’t impressively executed; Wojciechowski is a talented performer with a lovely soprano singing voice, mad ballet skills, and a mean Cockney accent. However, these particular sketches add nothing to the subject matter of the play and weaken Almost A Genius’s driving force. Also, Air Bud? Is that the cultural reference you want to work into your show? That movie came out in the nineties, and I’m pretty sure Air Bud and any brothers he may have had are long dead. I’m only saying this as a friend. Despite these bumps, Almost A Genius is a very funny, very heartening show. As someone who has dealt with dark times before, I admire the bravery and the humor of Wojciechowski and the strength she has to wring joy from a very dark, but not hopeless situation. BFFs for life.